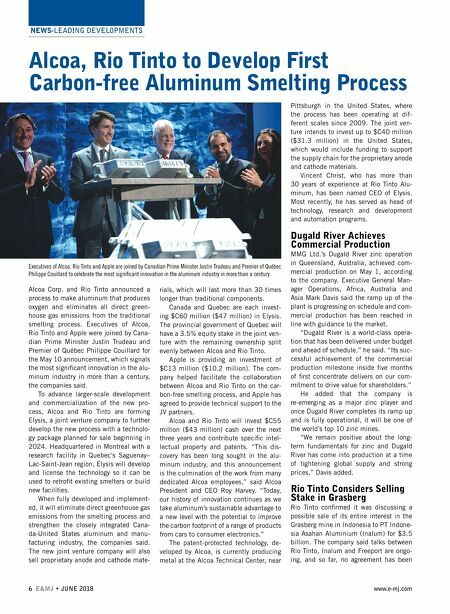 NEWS-LEADING DEVELOPMENTS JUNE 2018 • E&MJ 7 www.e-mj.com reached, and there is no certainty that binding agreements will be signed. Located in the Papua province in Indo- nesia, Grasberg is one of the world's larg- est copper and gold mines in terms of ore reserves and production. It is owned and operated by Freeport Indonesia (PTFI), a subsidiary of U.S.-based Freeport-McMo - Ran Copper & Gold Inc. Rio Tinto has a joint venture with Freeport-McMoRan for a 40% share of production above specific levels until 2021, and 40% of all produc - tion after 2021. In December, the Indonesian govern- ment extended PT-FI's temporary special license to June 30 to enable normal oper- ations to continue during the negotiation period. In February, PT-FI's export license was extended to February 15, 2019. Freeport-McMoRan said it continues to engage in negotiations with the Indone- sian government to restore long-term sta- bility for Grasberg and it's looking forward to reaching a mutually positive resolution. PT-FI is currently mining the final phase of the Grasberg open pit, which contains high copper and gold ore grades. It expects to mine high-grade ore until transitioning to the Grasberg Block Cave underground mine in the first half of 2019. WorleyParsons RSA recently completed a feasibility study update for the Wafi-Gol- pu Joint Venture (WGJV) in Papua New Guinea (PNG), giving the greenfield Wa- fi-Golpu Project a revised execution plan going forward. The update incorporates findings from earlier feasibility studies and draws on extensive data collection undertaken since 2016, providing a deep- er understanding of the project's geotech- nical, mining, processing, oceanographic, environmental and social parameters. It also forms an integral component of the revised proposal for development in sup- port of the special mining lease applica- tion, which was submitted to the Mineral Resources Authority (MRA) by the WGJV in August 2016. "The updated feasibility study sets out an improved business case for the Wafi-Golpu Project, and it confirms the preferred technical options to deliver the block-cave mining project safely and with appropriate consideration given to envi- ronmental, social and cultural heritage stewardship," said Bryan Bailie, execu- tive project director for the WGJV. Located in the Morobe Province of PNG, approximately 65 kilometers (km) southwest of the city of Lae, Wafi-Golpu is a joint-venture copper-gold project that is owned 50/50 by Harmony Gold Mining Co. Ltd. in South Africa and Newcrest Mining Ltd. in Australia. Various approaches to development, in- cluding infrastructure configurations, have been considered in the investigations for the development of the Wafi-Golpu depos- its. Early investigations considered large- scale open-pit mining of the Wafi deposit rather than underground mining; however, this was dismissed for various reasons. Subsequent investigations were highly successful in more accurately delineating an orebody, but further work was required to determine the economic viability of min- ing. A number of technical studies across various disciplines have been completed since 2012, which determined a viable business case for development of a large- scale deep-level block cave mine. The proposed development contemplated a significant upfront capital commitment to deliver maximum resource extraction and production profile over the project's life. Based on the orebody dataset improve- ment achieved in 2016, the update now incorporates a much larger mine than pre- viously anticipated and mining through- put will be increased from 3 million met- ric tons per year (mt/y) to 16.84 million mt/y. This increase in throughput required the redesign of the underground material handling system, process plant, associat- ed infrastructure, and overland concen- trate and tailings transport pipelines. In setting out the updated business case for the feasibility study update, Wor- leyParsons RSA drew on SmartPlant design technology that uses rapid prototyping, and other innovative processes such as Build- ing Information Modeling (BIM) to create a sophisticated digital-project-design plat- form and prepare for project execution as efficiently and cost effectively as possible. "By using intelligent design tools, we were able to incorporate all the consul- tants and role players involved in the pro- ject into one user-friendly digital model," said senior project manager, WorleyPar- sons RSA, Niell McEwan. He explained that SmartPlant is a portfolio of design and data management solutions that captures integrated engi- neering knowledge to enable productivity gains and improving engineering efficien- cy and design productivity. BIM augments the three primary spatial dimensions of width, height and depth with 3-D, 4-D and 5-D technology, allowing the entire project team to visualize project objec- tives as never before, greatly improving operational efficiency in a dynamic time and cost-saving environment. General Manager for Engineering and Construction for WGJV Leigh Cox said, "We were impressed with WorleyParsons RSA's use of BIM for the feasibility study update as it showed us how quickly different com- ponents and disciplines can be merged together to help evaluate design, optimize resource utilization and identify design risks upfront and on an ongoing basis." If developed, the Wafi-Golpu Project will be the largest, deepest and most complex underground mine in PNG, with a mine life of 28 years. 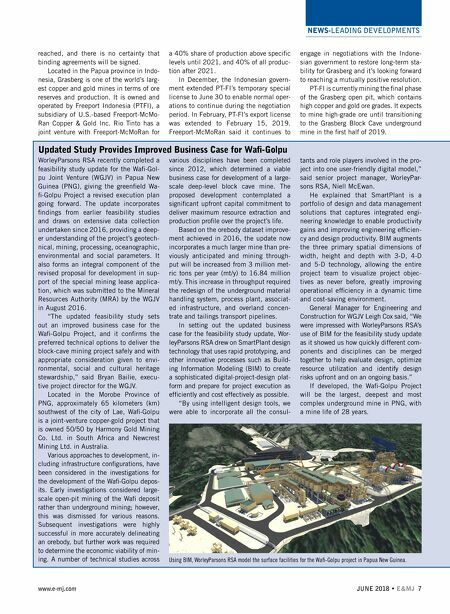 Updated Study Provides Improved Business Case for Wafi-Golpu Using BIM, WorleyParsons RSA model the surface facilities for the Wafi-Golpu project in Papua New Guinea.